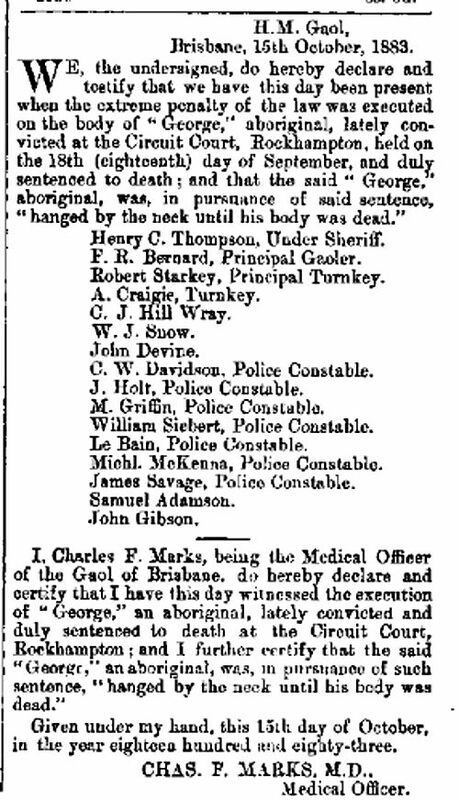 The standard rituals of executions at Boggo Road had a precise, theatrical quality. The movement and ceremony was designed to lend the governmental killing a sober and sombre air, to civilise the inherent act of barbarity at the centre of the proceedings in order to distinguish it from the crime of the criminal. Three Sundays were allowed to pass between sentencing and execution, providing time for any appeal to be heard, and for the prisoner to contemplate their spiritual concerns. Monday morning, 8 a.m. was the stipulated time for hangings. On the evening before their execution, condemned prisoners were often given a sleeping draught to help them spend a calmer night. The last morning started early with a wash, their choice of breakfast, and a cigarette or two if they smoked. If desired, they would then be visited by their religious minister, who would now stay with them until the end. The executioner would be carrying out his preliminary preparations while the undertakers arrived. A cheap coffin was carried into the cellblock and either placed underneath the platform or held in an adjacent cell. From around 7 a.m. various other officials would arrive and congregate in the prison governor’s reception, awaiting their assignments. These included the sheriff or under-sheriff, the principal warder, a government medical officer, undertakers, reporters and a detachment of police constables. Other people were sometimes allowed inside to witness the hanging, such as visiting judges, foreign journalists, and medical people linked to the case. Sometimes certain specialists, such as phrenologists, were also present. However, members of the public and even the family and friends of the victim or the condemned person were not permitted inside the prison except on rare occasions. Care was taken to ensure that the other prisoners in A Wing did not see the executions, and they would be removed to the yards. A few minutes before 8 a.m. the sheriff or under-sheriff, along with the prison governor, a doctor, two or three principal warders and the executioner, would proceed to the condemned cell to read the death warrant to the prisoner. The gathering would then move to the adjacent pinioning room where the prisoner was unshackled. 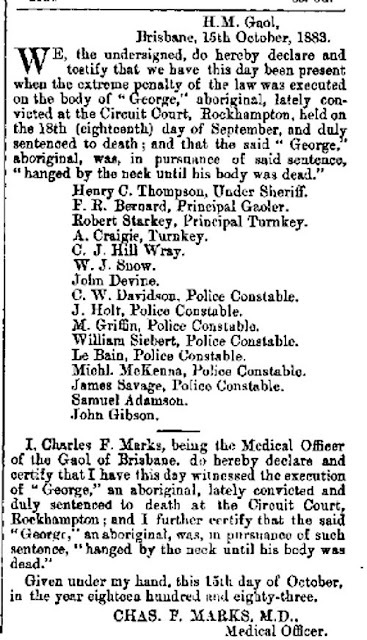 The prisoner’s neck was then bared and his arms pinioned by the hangman. These physical restraints minimised resistance and an uninterrupted drip through the trapdoor. The legs were left free so that the prisoner could be walked to the scaffold. If a religious minister was present, he would be praying out loud during this short journey, positioned behind the governor and in front of the prisoner. Once upon the scaffold, the prisoner would have his legs tightly pinioned with leather straps. At this stage the prisoner was permitted to speak if they so wished. Some took this chance, but many declined and faced death in silence. As soon as any speech here was finished, the hangman would act as quickly and efficiently as he could, stepping forward to put the noose in place. The execution ropes used around this time did not have a knot to create the noose, but instead had a smooth metal ‘eye’ surrounded by two strands of rope and held in position on the neck with a hard latex washer. A white linen hood was then placed over the prisoner’s head and face. This hood saved the official witnesses the ‘discomfort’ of seeing the prisoner’s face just before, during, and after the execution; to hide any wounds; and also to ensure the prisoner did not see when the lever was about to be pushed. After the lever was pushed by the executioner, the prisoner would drop through the sudden gap in the platform and come to a sharp jerk of a stop, suspended and swaying in front of the witnesses on the ground floor. Anything from 10-25 minutes were allowed to pass before the doctor would approach the body to search for signs of life. He would feel for a pulse at the wrist, and on not finding one would declare life to be ‘extinct’. Although the regulations required the body be allowed to hang for one hour, in practice it was usually taken down well before this time, especially if the death had been particularly bloody. A team of warders were positioned on the top floor of the cellblock with a block-and-tackle set, ready to link with the rope after the hanging. This pulley system was used to carefully lower the body to the floor and into the coffin. The post-mortem involved dissecting the back of the neck to determine if and where it had been broken.